Best Price Guarantee ~ 30 Day Money back Guarantee. FREE GROUND SHIPPING within the contiguous U.S. ~ Shipments usually processed within 24 hours of purchase. GREENBURIALS.com is an Informational Research Resource website. As a Seller of Green and Natural Burial Cremation Urns that adhere to the Green Burial Council standards and best practice methods we offer smart, compassionate, "Green" Eco-Friendly Urns, Caskets, Scattering Tubes and Shrouds. 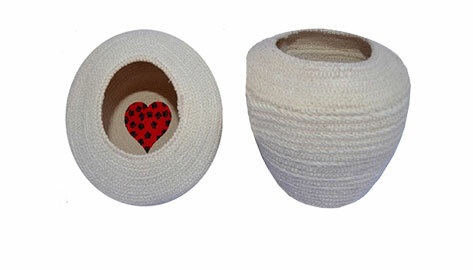 Other biodegradable funeral/cremation & memorial products include jewelry, Eco Friendly Stationery and Pet specific urns. All Cremation Urns come with the added distinction of being airport security x-ray approved to pass through in carry-on luggage. Our urns are TSA (Transportation Security Administration) approved and have earned a highest "THREE LEAF" rating by Green Burial Council Standards/Eco-Rating System for Products. If you have a family member or friend that has expressed interest in an environmentally friendly funeral, and requires a fully certified, bio-degradable casket, I urge you to contact Darius at GreenBurials.com. After a close family member recently passed away, we were told by the funeral home that it would take a minimum of four days to obtain a bio-degradable bamboo casket. Later that evening, I searched the internet to see if there were options for a quicker delivery. I truly believe that God directed me to greenburials.com and Darius. Believe me when I tell you that Darius is an angel from heaven. He is caring, compassionate, and most of all he delivers phenomenal customer service. I first talked to Darius the evening my family member passed away. The very next evening, he had a beautiful, bamboo casket waiting at our city’s airport. Darius proactively stayed in contact with us throughout the process. He explained the options available for the casket, took the order over the phone, communicated the freight location at the local airport, called the next morning to ensure that we received the casket and that everything was OK. I cannot emphasize enough how appreciative our family is of greenburials.com and Darius’ compassionate and efficient attention. GreenBurials.com is proud to present BioUrn®, by My Eternal Family Tree, a leading provider of "living tributes" to commemorate the loving relationship between you and your pet. "The BioUrn is hand made from biodegradable materials and holds the seed of your chosen tree, called a "SeedBead"®. The SeedBead is encased in clay and nutrients, to enhance germination when planted"